True life stories of recovery and hope through the IMTI Program as told by mothers in their own words. Over the past 15 years, I have had the privilege and honour to work with hundreds of amazing families - parents who advocate for their children with tireless energy and abiding commitment. 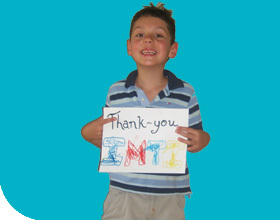 Please enjoy the inspiring stories and notes below about how the IMTI Program has positively impacted many lives. It�s Saturday morning and I really wanted to thank you for being in our lives. I�m thinking a little bit today that on the 25th it will be our third year anniversary of our home-based program for Julianne and what a difference you�ve made by in the last year. I honestly don�t know if I would have kept going had you not entered into our life. Now I feel like we are just starting, and so it is really exciting. Thank you for being in our life! Today, for the very first time, my 4 year old son Evan enjoyed a (struggle- and tantrum-free) professional haircut! 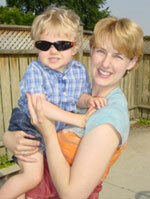 Evan, diagnosed with PDD, had no language and a very short attention span. Along with his auditory and tactile sensory integration problems, haircuts were torture for him. I think back to the beginning of our home-based Intensive Multi-Treatment Intervention program when Evan wouldn't even walk through a door without having to open and shut it 15 or 20 times; and those fancy displayed hair products would have been spilled to the floor in no time. There's absolutely no way he would have sat on a chair for even 3 seconds and just the sound of the hair drier would have scared him right back out to play again with the door before we'd some how get him back into the vehicle. But today, after one year of IMTI family training, Evan sat patiently with me for 15 Minutes (!) waiting for his turn at the Barber�s. When his turn came, the hairdresser buzzed his hair with two types of clippers and then used scissors; Evan sat still and watched in the mirror with curiosity. And best of all, they chatted away as she cut his hair! 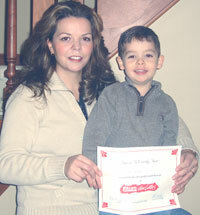 The hairdresser gave Evan a certificate for having his first haircut. Something we couldn�t have imagined when we were originally given the bleak prognosis. Now, with the strategies and positive attitude we�ve learned from Jonathan, I have hope and believe that Evan will continue to have many more successes. Coleman received a diagnosis of autism at age 2 � along with no suggestions of hope from our physician. She told us �there�s not much you can do for him except for some Occupational therapy and some longer-term care options�. Despite the long drawn out process of trying to get a diagnosis and clear answers, our disorientation of not knowing what to do was changed through prayer and research on the internet where we initially found hope for our son and started him on a gluten- /casein-free diet. We immediately witnessed encouraging results through biomedical interventions but progress was slow. In addition to diet changes, we initially tried behavioural techniques at home while on the provincial ABA wait list however; this seemed to strain my relationship with my son. Coleman constantly ran away from me, desperately avoided eye contact, affection and generally pushed away from us. One of his numerous repetitious behaviours was to line up cars, cards and shoes in long rows. Coleman would also spin in circles for long periods of time with his eyes turned in the opposite direction of which he was turning. He pushed away from physical contact and had no language development. His frequent tantrums, crying, and fits of frustration left us anxious and feeling helpless; we didn�t know how to communicate with him or help him to feel better. After learning about of two autistic boys who were making remarkable progress in an intensive treatment program called IMTI we were inspired to contact the founder Jonathan Alderson. In the first couple of months of therapy an unexpected change occurred in me that began a relationship with my son!! The IMTI approach helped me to accept Coleman and enjoy my beautiful son for who he was in his autism; without needing him to change. This experience was an incredible breakthrough not only for me but this new relationship was the beginning of Coleman opening up to us! Throughout the last 2 � years of IMTI therapy, Jonathan has guided us through the many challenges and rewards of raising an autistic child. There is no question for us that IMTI is the right program for Coleman and our family. Jonathan has provided us with the tools to be confident and caring parents as well as effective playroom therapists. Coleman is now 5 years old and has developed beyond what we were initially led to hope for our beautiful little boy. He is constantly making progress in the program. He rarely spins in circles except in a game and is now able to sit at his work table and focus on learning for up to 20 minutes. He seeks out affection and cuddles, giving us kisses before bedtime and generously on request throughout the day; he is very affectionate. He is now able to communicate in sentences and is eager to listen for and use new words. He asks us to �kiss him better� after a bump or scrape and his language continues to improve using poems and songs. We are especially delighted to watch as Coleman now initiates play with is baby sister who he completely ignored and avoided just two years ago. Without doubt, Coleman has far surpassed the limitations placed on him at his time of diagnosis. We are grateful for the multi-treatment approach that has guided us through the biological treatment, educating Coleman, and provided us as parents and therapists with a positive attitudinal perspective toward greater acceptance and love of our very special child. We now see Coleman as a gift in our lives. Thank you IMTI!